Pond’s – the new Fair & Lovely? A New York based pharmacist Theron T Pond is credited with the invention of Pond’s in 1846. Pond’s Cold Cream and Vanishing Cream was launched in 1914 in USA. Pond’s became a part of the Unilever family in 1987. The brand is available in India from 1947 and current it’s an international beauty icon with presence in 58 countries across the world. The brand offers two main products: cream and talcum powder. Historically the positioning of Pond’s Cream is not very consistent. Though the core of Pond’s is softness or gentleness they unsuccessfully tried to position in the quick-action fairness segment for a short duration during 1980s. 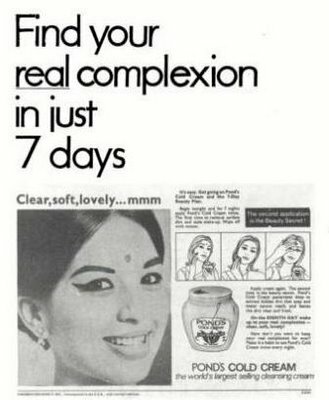 For example following ad of Pond’s cold cream says: “Find your real complexion in 7 days”. It was good that HUL realized that one brand cannot do everything and the job of making girls fair was given to the brand ‘Fair & Lovely”. Currently, the benefits of Pond’s cold cream i.e. of smooth and soft skin are promoted in ADs with soft skin of good looking girls being pinched by relatives with love. The tagline of the product is: ‘Komal Chera Pyar Se Bole’ i.e. ‘Soft and lovely skin”. The main benefit that this product claims to provide is magical fragrance. This is propagated in ADs with guys becoming romantic by smelling the fragrance of Pond’s Talc used by girls. The tagline of the product is: ‘Yeh Khusboo Hain Ya Zadoo’ i.e. “It’s not just fragnance, it’s magic”. Recently Pond’s is promoted as a key brand in the lucrative anti-aging segment with the launch of ‘Pond’s Age Miracle’ range. It has also introduced 750 counters across 74 cities where more than 1000 well-trained advisors will help consumers to find advises on best skin care for their skin. Apart from regular promotions and advertising Pond’s used event sponsorship in a big way. They were the main sponsor of Beauty Contest Femina Miss India till Pantaloons took over as the main sponsor of the event. As Pond’s is targeted to women and is in beauty industry – sponsoring a beauty content made perfect sense for the brand. Very recently Pond’s Lotion is again trying to position itself in the skin whitening segment with a positioning similar to Fair & Lovely. You might want to read my earlier post “Is marketing meant for exploiting the consumers?” in this context. The following 2008 ad of Pond’s talks the story of a girl, her boyfriend and a second girl. The story says the guy leaves the first girl because she is not white enough. And, the end suggests that use Pond’s to get ‘White Beauty’. This entry was posted in Featured, Marketing Practice and tagged Branding, Brands of India, Cold Cream, FMCG, HUL, Industry, Others, Personal Care, Pond's, Social Marketing by Dr. Angshu. Bookmark the permalink. Does this mean that Indians are third rate people? and is this still the white man thinking he is still the king of the hill. We will do anything to chase is tail?. Is money more important to Priyanka Chopra and saif Ali Khan the been an Indian? SURELY Indians must feel inferior when they meet white people, knowing that white people know that Indians will do anything to be like them.